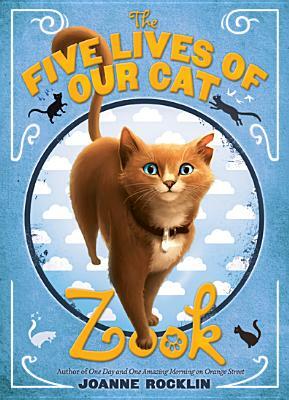 In this warmhearted middle-grade novel, Oona and her brother, Fred, love their cat Zook (short for Zucchini), but Zook is sick. As they conspire to break him out of the vet's office, convinced he can only get better at home with them, Oona tells Fred the story of Zook's previous lives, ranging in style from fairy tale to grand epic to slice of life. Each of Zook's lives has echoes in Oona's own family life, which is going through a transition she's not yet ready to face. Her father died two years ago, and her mother has started a relationship with a man named Dylan -- whom Oona secretly calls "the villain." The truth about Dylan, and about Zook's medical condition, drives the drama in this loving family story.